Goodreads Summary: In 2083, chocolate and coffee are illegal, paper is hard to find, water is carefully rationed, and New York City is rife with crime and poverty. And yet, for Anya Balanchine, the sixteen-year-old daughter of the city's most notorious (and dead) crime boss, life is fairly routine. It consists of going to school, taking care of her siblings and her dying grandmother, trying to avoid falling in love with the new assistant D.A. 's son, and avoiding her loser ex-boyfriend. That is until her ex is accidently poisoned by the chocolate her family manufactures and the police think she's to blame. Suddenly, Anya finds herself thrust unwillingly into the spotlight--at school, in the news, and most importantly, within her mafia family. A world where caffeine and chocolate are illegal? The horror! I knew I had to read this book from that premise alone. In All These Things I've Done, the Romeo and Juliet story meets a futuristic, dystopian world filled with organized crime, creating a tale that is new and engaging. For years, Anya Balanchine has been responsible for keeping her small family together. The daughter of an organized crime boss, she has struggled to stay out of her family's politics. She is managing everything until, one day, her ex-boyfriend is discovered to be poisoned by her family's chocolate. Anya is suddenly reliant on her family's connections to clear her name, but surprisingly, the most help comes from an unlikely source. As the situation within her family becomes more complicated, Anya tries even harder to protect her siblings. But she can't help but be distracted by Win, the handsome son of the new District Attorney. Soon events spiral out of control, both in her relationship and with her family. Anya knows she will have to take a stand if she is to keep her family safe...but will it work? I loved Anya's voice in this story. Her character was incredibly vivid, and she really came to life off of the page. Because of her life, she felt the need to keep most people at arm's length, which made her relatable, and her fierce loyalty to her family and her constant reminders of her father's advice made her that much more real. And then there was Win, who was incredibly sweet and determined to make things work with Anya even when she was convinced that they couldn't. There is also Yuri, an old family friend, and one that I found quite intriguing. I will be interested in seeing what part he plays in future books. I also enjoyed the family aspect of this novel - Anya's talks with her grandmother (on her grandmother's good days) and the way she came to learn to work with Natty and Leo instead of merely making decisions for them. While there is romance and heartfelt moments, this book is also full of the secrets and scheming that one might expect from a mafiya family, and this constant action really drives the story. However, I did have a few problems with some of the details in the book. While I found the world that Zevin created very interesting, I didn't always understand all of the rules. Even the structure within Anya's family seemed unclear at times. I also would have enjoyed seeing more of Anya's emotions, to see more of a slip in her hardened exterior, but for obvious reasons she always tried to stay strong. However, I am curious to see how the events from this first book will change her in the second. 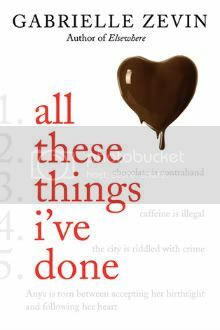 A multi-faceted, fast-paced novel, All These Things I've done is a great addition to the dystopian genre. I am looking forward to reading more from Gabrielle Zevin! gah i LOVE dystopian novels! This one sounds great! Thanks for sharing! I love dystopian! this one sounds so great! Thanks for the review! This sounds like a great dystopian book. I can't wait to read it. Great review.